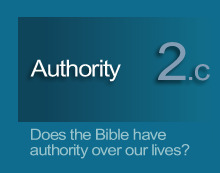 2.4 God the Spirit: the messenger of authority. The Holy Spirit is the person of the Godhead through whom God chiefly interacts with mankind. The Spirit indwells believers so that they may become empowered for service and godly actions. The Spirit intercedes to help us in our prayers (Rom. 8:26, 27), and is given to us at our rebirth as a guarantee of our inheritance of eternal life (Eph. 1:13,14). Then the Spirit of the Lord came upon me, and he told me to say: 'This is what the Lord says...' (Ezekiel 11:5 NIV, see also Matthew 10:19b, 20, and 2 Peter 1:21). Because God's character is one of perfect and permanent integrity, so his words perfectly and permanently convey his divine authority. Not only are his words authoritative, but the Spirit conveyed God's words to the ancient writers in like manner because the Spirit is, in nature, God. Flesh gives birth to flesh, but the Spirit gives birth to spirit" (John 3:6 NIV). The Spirit is also described as having made men overseers of the church (Acts 20:28) and as being the only one to know the thoughts of God (1 Cor. 2:11). May the grace of the Lord Jesus Christ, and the love of God, and the fellowship of the Holy Spirit be with you all. (2 Cor. 13:14 NIV). ...Who have been chosen according to the foreknowledge of God the Father, through the sanctifying work of the Spirit, for obedience to Jesus Christ... (1 Peter 1:2a NIV). Therefore go and make disciples of all nations, baptizing them in the name of the Father and of the Son and of the Holy Spirit. (Matthew 28:19 NIV). This chapter briefly describes the authority of God as Scripture applies it to God the Spirit.